Action Marine's black weapons tree included a raft, a rifle, a missile, an oar and a post to mount the rifle on the raft. A green backpack and missile launcher were also included in the package. This front cover opened to reveal the left and right images below. The back cover showed the four individually boxed 30th anniversary figures. Action Marine was first sold individually boxed (above). 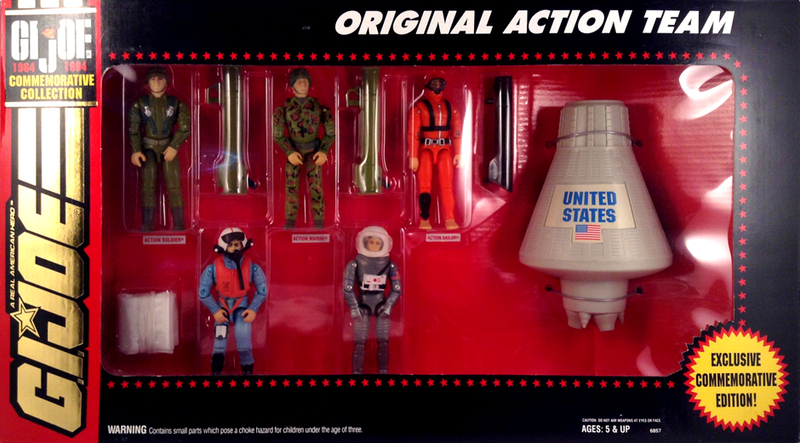 He was later sold in the Original Action Team boxed set (below). Note that the individually packaged 30th anniversary figures featured card art on the file cards, while the boxed set featured product photos. There are several differences in the 30th anniversary figures released individually, sometimes including paint apps, serial numbers on their feet, and different colored accessories. For full coverage of these differences, visit this 3DJoes Facebook album.